A few nights before Pentecost (the holiday celebrating the gift of the Holy Spirit and the beginning of the Church as, like, a thing) we’re joining with our partners in faith-based crime to create a night of stories themed around revelation. Revelation is having your heart or mind expanded in an unexpected, powerful way, and we’re coming together across lines of faith to hear revelation stories. 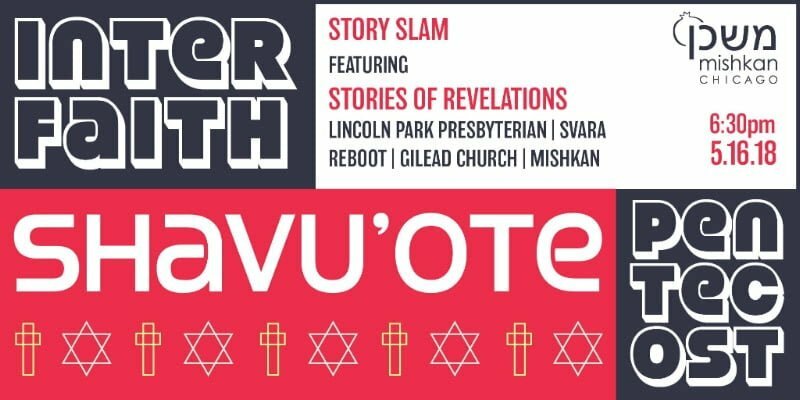 Come for inspiration, creativity, curated stories of revelations, and of course, traditional Shavu’ote food (bring your Lactaid*). Revelation waits for no one, so get registered. If the $15 is prohibitive, PLEASE reach out. We’ll keep it confidential (obvi) and get you in! Why do a Pentecost and Shavu’ote interfaith event? What even IS Shavu’ote? Come find out! *Traditional Shavu’ote foods include dairy foods, like blintzes and cheesecake. Or a mac n’ cheese bar. Gluten free + vegan options included!